Think you’re too smart to fall for a phone scam? So did the former mayor of a Southern California coastal town — until he became a victim. Gary Nielson is the chef and owner of the Beachfront Barbeque Restaurant in tiny Carpinteria, California, just north of Ventura; he also served as a city leader. "I was on the city council for eight years, I was the mayor for two of those years," he told NBC4. With his ability to oversee budgets and serve his constituents, Nielson never could have predicted a scam artist would be able to trick him into handing over thousands of dollars. It happened recently, as he prepared for the lunchtime rush at his restaurant. Working alone in the kitchen, he heard the phone ring. When he picked up, a man claiming to be a customer service representative for Southern California Edison was on the other end of the line. "He told me, 'I have a service man in your area who's been instructed to turn your power off because you have a disconnect notice, and you’re late on your bill,'" he recalled. The call had come during the winter, when business is slow. Nielson knew he was late paying what he owed, and worried losing power would be a disaster for his restaurant. "Each one of those things has perishables in it, and those perishables start degrading instantly," he said, pointing at his refrigerators. 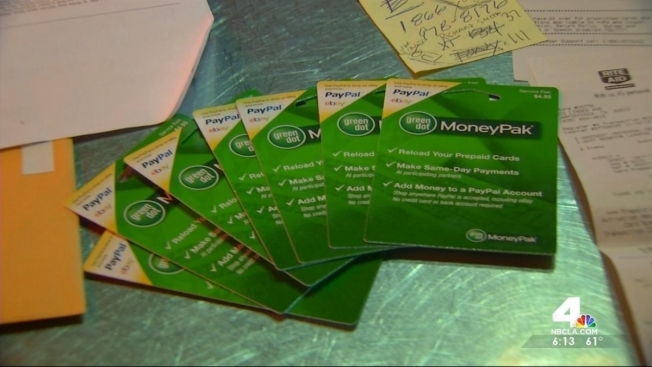 The caller told Nielson the only way to avoid disconnection was by paying immediately with Money Pak cards. "(He said) you need to buy four $500 (cards) and one $395 one," Nielson said. Nielson rushed to a nearby drugstore and did as he was told, giving the caller the card information. Even worse, the scammer called back, threatening disconnection if he didn’t pay part of next month’s bill. All told, he paid $3,395 — despite having owed just $1,700. He only realized his mistake when he told his wife what had happened. "She said 'Oh my God, you were scammed," Nielson recalled. The I-Team reached out to Southern California Edison, which said about 14,000 customers have reported being targeted by this ruse. "Five-hundred of those customers unfortunately were victims of the scam," said Kari Gardner, SoCal Edison’s manager of community affairs. She said the utility company is now warning customers about these phone scams on its websites, and in its monthly bills. "Southern California Edison will not call a customer and demand immediate payment to avoid interruption," she said. Nielson told NBC4 he wish he'd had that information before his phone rang that winter morning. "You’re embarrassed, humiliated, frustrated," Nielson said. But he’s speaking out, because he knows he’s not alone. "Every time I say something to somebody, they have this story of somebody that they know personally (who has) been scammed in one way or another," he said. "Off" Phone Numbers: Southern California Edison (SCE) only uses 800 numbers for customer contacts – phone scammers often use "off" numbers, such as 888. Extension Numbers: Imposters use extension numbers to make themselves appear more "legitimate." SCE does not use extension numbers. Threats: SCE will not threaten customers with service shut-off until after 2 weeks of warnings. Reloaded Debit Cards: SCE does not accept Green Dot, Vanilla, or other reload debit cards. Weekend/Holiday Calls: SCE does not call customers on weekends or during holidays.